Sony at CES 2018: 5 key highlights, including 4K OLED TVs and wireless earbuds | What Hi-Fi? Sony announced a multitude of products at CES 2018, from 4K OLED TVs to second-gen wireless in-ear headphones, a new 4K disc-spinner... and even an 8K TV prototype. Refinement of existing technology - rather than complete reinvention - was the theme of Sony's CES 2018 announcements but, when you've had such a hugely successful 2017, we're more than happy to have more of the same. But, you know, better. 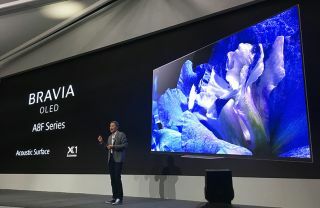 Second generations of its much-lauded 4K OLED TV range and wireless in-ears were revealed, along with new soundbars, 4K Blu-ray players and AV receivers. But we'd be fools to think Sony wasn't already looking towards the future: a prototype 85in 8K display with next-gen processing was also on demo, showing just how advanced picture performance can really be in the near future. We'll no doubt be bringing you more details on Sony's new products in the upcoming days, but here are our particular highlights from this year's Sony CES 2018 announcements. After the success of Sony's first 4K OLED TV range - the Award-winning A1 series - we were understandably excited to clap eyes on the next generation of Sony OLEDs. AF8 is the name of Sony's 2018's 4K OLED series and, perhaps a touch anti-climactically, it features the same 4K HDR X1 Extreme processor and Acoustic Surface technology we've seen on the A1. At least we're guaranteed a certain level of quality, but we'll be sure to ask Sony what else has been tweaked. The most discernible difference is the AF8 55in and 65in TVs have a more sensible, square stand that is more likely to fit on most TV racks. Sony has also unveiled a new premium range of 4K LCD TVs, which share the same X1 Extreme picture engine as the OLEDs. Equally sensibly, Sony hasn't felt the need to introduce yet more inexplicable HDR formats. Both the OLED AF8 and LCD XF90 ranges feature the standard HDR10 and HLG formats, along with Dolby Vision HDR. There's a new Sony 4K disc-spinner joining the much-lauded UBP-X800: the UBP-X700. Yours for just £270, the X700 will most definitely support Dolby Vision HDR alongside the standard HDR10 and 4K resolution. But you'll have to wait a bit for that update: the new player goes on sale this very month, but the Vision update is due in Spring. Noise cancelling and splash-proof? Sony's second-generation truly wireless earbuds are aiming to be the perfect headphones to accompany your gym sessions. The WF-SPN700N in-ears are fully wireless, feature NFC, three hours of battery life (you get two more charging cycles via the carry-case) and offer digital noise-cancelling as well as IPX4-rated resistance to rain and sweat. Available from June 2018 in four finishes, we hope Sony has fixed the occasional drop-outs we experienced from the otherwise-brilliant Award-winning WF-1000x earbuds. We're big fans of Sony's STR-DN1080 AV receiver: a £500 home cinema amplifier that sounds absolutely fantastic. It proves sometimes you can take your time to build the best AV receiver for the money. The DN1080 finally embraced the Dolby Atmos and DTS:X object-based surround sound formats, and so we're not surprised to see Sony employ both in the newly announced 7.1 channel STR-DH790 AV receiver. The new amp is capable of a 5.1.2 Atmos configuration, supports 4K and HDR (including Dolby Vision), its four HDMI inputs are HDCP2.2 certified, and can play hi-res files. Let's hope it lives up to its Award-winning sibling's reputation. Last but not least, Sony dazzled us with prototypes of its upcoming, next-gen picture processor - the X1 Ultimate - in action. Demos with the X1 Ultimate employed in 4K OLEDs and 4K LCDs were great to see (especially compared with the Sony TVs using the current picture engine), but the icing on the cake was an 85in 8K display with the X1 Ultimate powering the picture. The new chip is capable of outputting a mindboggling 10,000 nits - the maximum peak brightness that HDR is truly capable of with 8K. It looked glorious. Unlike the eye-searingly sharp, overly processed look we sometimes see with higher resolutions, this Sony prototype looked breathtakingly natural and realistic. We don't yet know if we'll see X1 Ultimate-powered TVs at IFA 2018 or have to wait a whole other year until CES 2019, but it's certainly something we'll be keeping our eyes peeled for.